I think you might have gathered by now that I love passion fruit and I’m shattered that it’s so hard to find up here in the Pacific Northwest. But thanks to my Australian connections, I have a small stash of the canned pulp at my disposal. I’m not joking; it’s very small. I have three cans left that are about 4 oz each. I made one can last a month by using it sparingly in and on desserts – a little goes a long way. Ev and I had some friends over for dinner on Friday night, and I wanted to make something new for dessert. Chocolate eclairs had to be on the list but I have made so many Pavlovas recently (I can see some people nodding) that I felt the need for a change. I had a few tablespoons of passion fruit pulp left over that needed to be used before we go home to visit for two weeks and an 8 oz pack of cream cheese. So I knew whatever it would be would have passion fruit cream cheese icing either in or on it… which is my favourite icing ever. 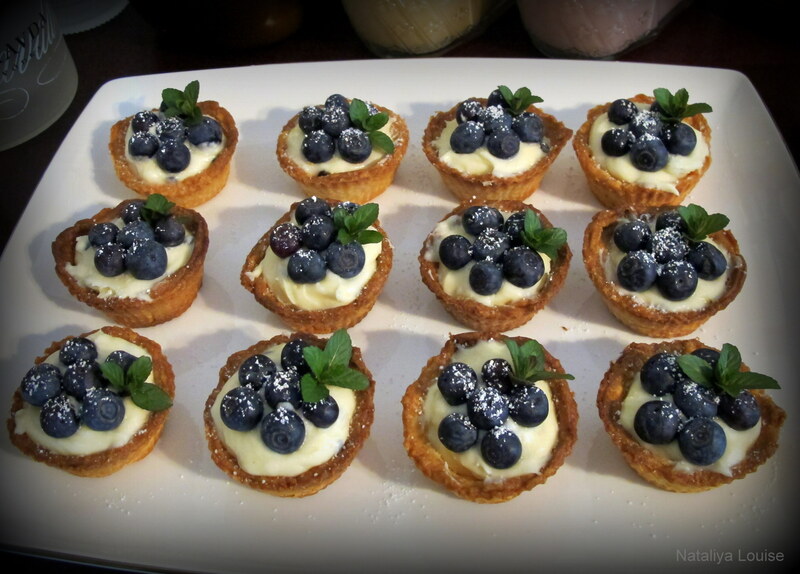 Eventually I decided on passion fruit cream cheese fruit tartlets with blueberries on top. That’s a pretty good mix of fruit to me. Here are the recipes for the different components used in making them. This recipe is shown in more detail here. To make it with wheat flour, just substitute normal plain flour for the GF plain flour and omit the xantham gum. 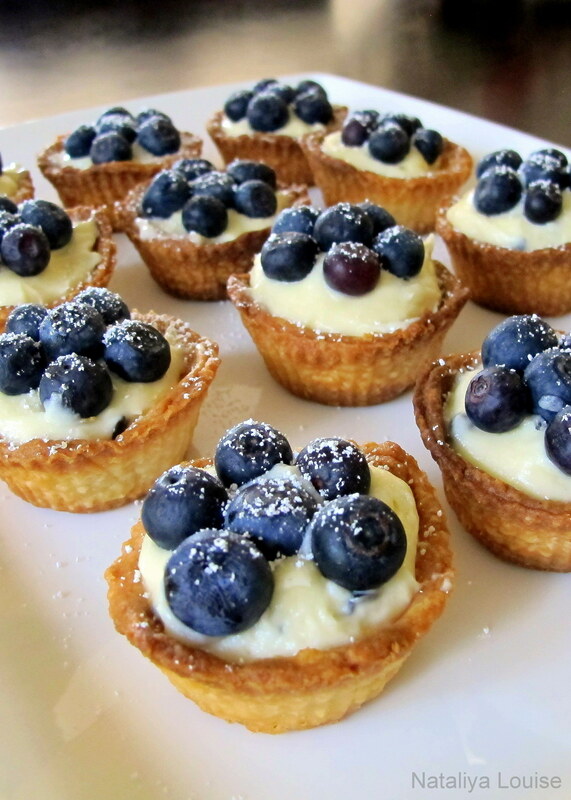 Preheat the oven to 200 C or 390 F. Makes 24 mini tart shells/tartlets. Sift the flour and xantham gum (and the optional sugar) into the bowl of a stand mixer. Dice the butter into small cubes and add to flour mix. Blend until the butter has combined with the flour and the mixture resembles bread crumbs. Add the sour cream gradually until the dough leaves the sides of the bowl and forms a ball. It should be tacky but not sticking to your fingers. Wrap the dough tightly in glad wrap and refrigerate it for approx. 20 minutes before working with it. Try and keep handling of the dough to a minimum, or the butter will begin to melt. If this happens, re-wrap the dough and place it in the fridge for another 5 minutes to chill it and begin again. When the pastry warms up it becomes increasingly fragile and harder to work with. Place the unwrapped ball onto a GF floured bench and knead for 30 seconds. Cut pastry ball in quarters. Roll the pastry between two layers of wax paper (to prevent sticking) until it is about 3mm thick. 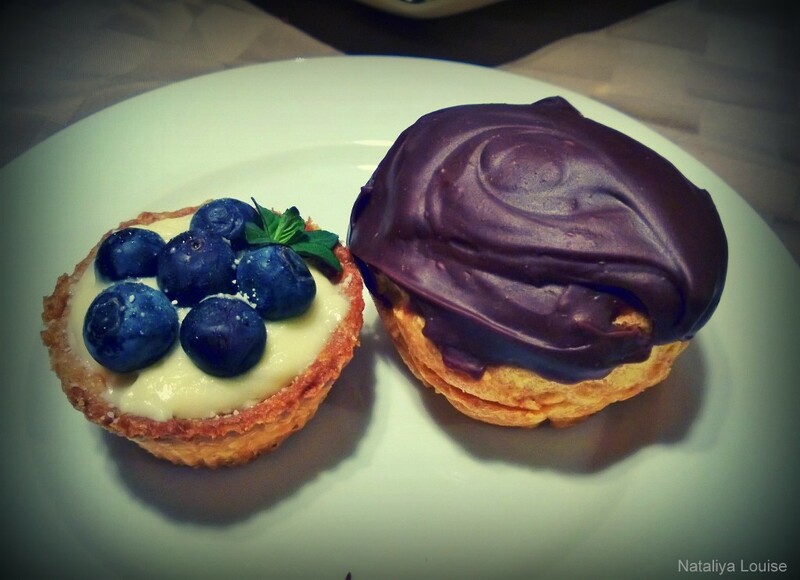 GF pastry can be temperamental and fragile. Peel off one side of the wax paper, then replace it loosely; flip the dough over and remove the other sheet of wax paper and slice it into six roughly even pieces. Peel each piece off the wax paper gently and then carefully transfer the pastry into the awaiting pan. Spray your dishes with olive oil to assist with pastry removal later on. At this point, I like to freeze the pastry for about 10 minutes before blind baking it. Then, I add baking paper and ceramic baking balls to prevent bubbling while baking and bake it at 200 C for 10 minutes. Set a timer. Remove the baking paper and pie weights and return the pastry to the oven for another 5-10 minutes. When it is golden brown, it is completely cooked. Place them in their pans on a cooling rack for 15 minutes and them remove from the pans and cool completely. 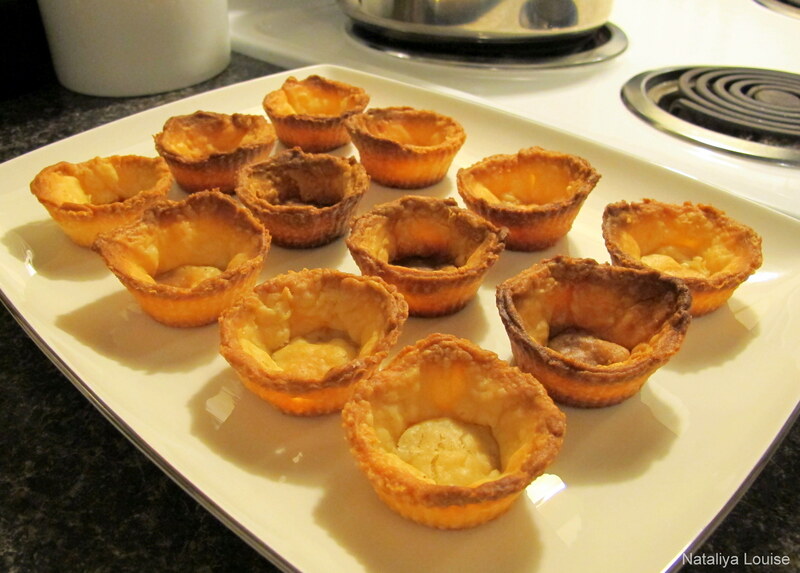 The cooked tartlet shells – unfortunately my oven developed a hot spot at the back left corner. As you can see, the not-so-pretty shells are hidden in the middle. They still tasted fine. 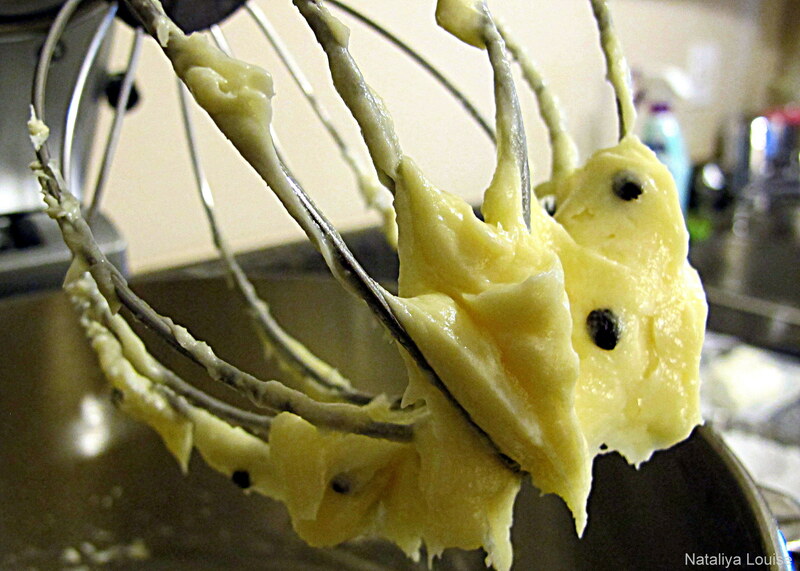 Beat the cream cheese, butter, passion fruit pulp and vanilla extract together until they are light and fluffy. Gradually add the icing sugar, beating each portion til it is well combined. The amount listed is a guideline only, you might have a sweet tooth and want to put in the full 2 cups. As one of our guests pointed out, the “tartness” that passion fruit can sometimes bring to a meal wasn’t present here. I think that it’s due to a combination of using canned passion pulp as well as the generous amount of icing sugar involved. It couldn’t be more simple. 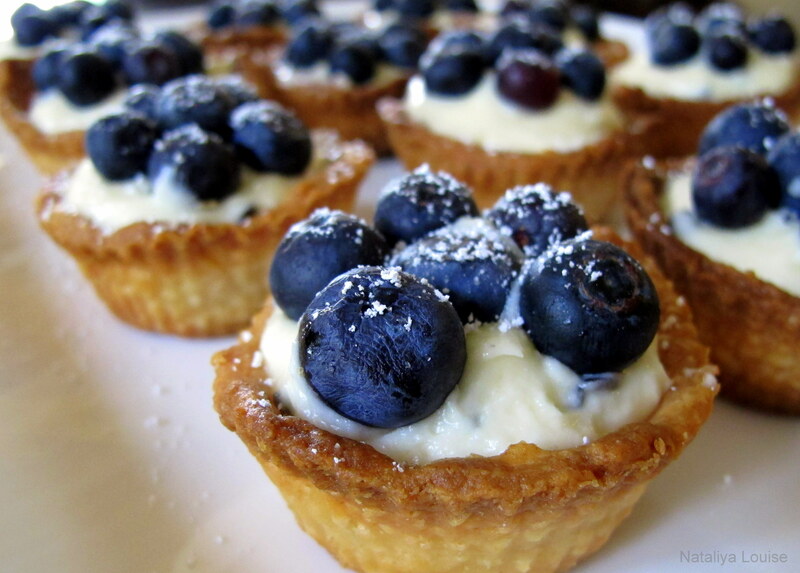 Dollop a generous amount of the cream cheese mixture into the tartlet shells and decorate with blueberries. I decided after a little while that they needed a little extra something, so I picked some mint leaves from our herb garden and used it as a garnish. 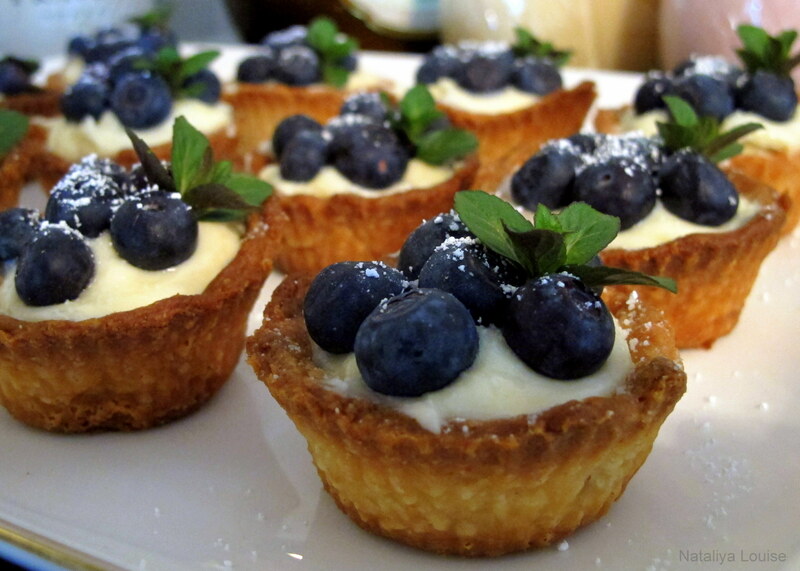 It made the blueberries look a little like a flower, which was nice. Dust with icing sugar closer to when you serve, or it will absorb moisture over time and you will lose some of the “powdered” look. Served with gluten free/fructose friendly chocolate eclairs for dessert. This entry was posted in Sweet pastries, pies & tarts, Sweets and Desserts and tagged afternoon tea, Aussie, Australia, Australian, blueberries, blueberry, brunch, cream cheese, cream cheese frosting, cream cheese icing, dessert, fructose friendly, fructose malabsorption, fruit, gluten free, high tea, low fructose, morning tea, passion fruit, passion fruit cream cheese, sour cream pastry, tart, tartlet, tea. Bookmark the permalink.